This recipe began as a hunch. It grew in to an idea before working its way in to a full blown culinary MOMENT. My Soy-Free Vegan Chocolate Pie shouldn’t work and it certainly shouldn’t be a mind-blowing spoonful of silken chocolate goodness. But it is. This recipe is why I cook. 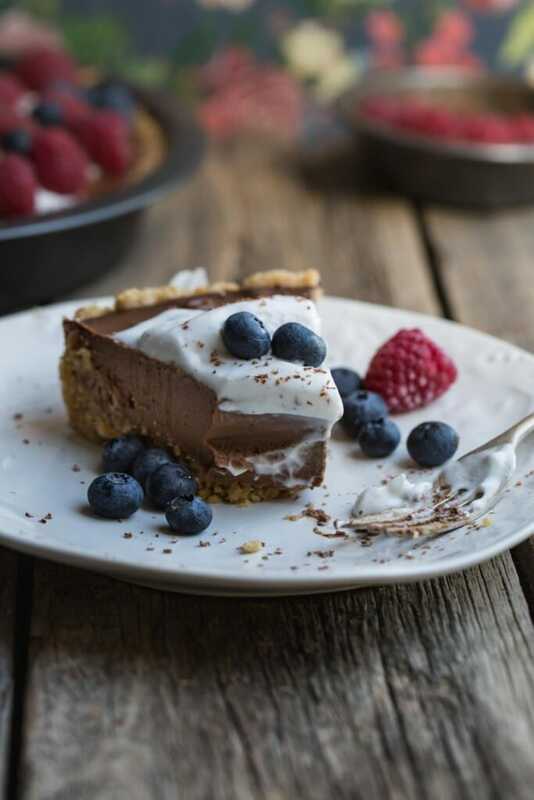 The amazing Lindsay at Pinch of Yum created a wonderfully decadent and simple silken chocolate pie recipe. The pie has only five ingredients and looks un-believable; it is also made from silken tofu. Never a dirty word in this house but I have many readers who don’t do the soy thing. And as I aim to please and love a challenge, I set about creating an alternative. I considered avocado but I’ve done that in a decadent mousse and I thought about coconut cream but I wanted less fat. And then a seed was planted. Or rather a chickpea. 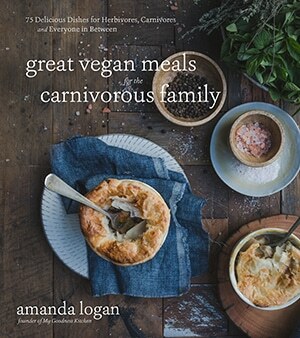 Now, before you run screaming I have to tell you, this soy-free vegan chocolate pie has completely blown my mind. It has taken me a week of testing but the result is out of this world. Rich, velvety and completely free of any chickpea flavour. How does it work? Well, I’ll tell you but only because this is a food blog and that’s my job. 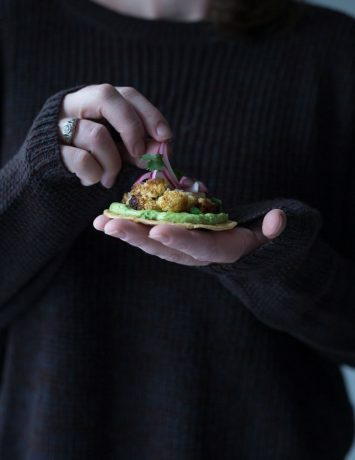 A few weeks ago I posted a recipe for a Game-Changing Chickpea Tofu Green Bowl using chickpea flour tofu. Well, there is more than one way to skin a chickpea and soaking them to create a chickpea milk and heating it creates silken chickpea tofu. On its own, I have to admit I am not a fan but blend it with melted chocolate, almond butter, maple and vanilla and you can pass me the pom poms because I needs to cheer. Silken chickpea tofu is ridiculously easy to make but you will need to begin the night before, soaking the chickpeas. After making and straining the chickpea milk and stirring it over heat it thickens and is ready to set for a few hours. You can make the tofu a day or two before you make the pie and store it in a sealed container. It will produce its own brine like tofu. I love the alchemy of this thing! Beyond that it is simply a case of choosing your pie crust and blending your way to chocolate heaven. I went for a pretzel base but you could use a gluten-free biscuit base, nut base or a simple vegan pie crust. This soy-free vegan chocolate pie has sent my imagination on a field trip without any supervision. As with all my recipes I have tested this pie on my non-vegan tribe and it has been a resounding success. Our builders devoured it, it’s Husband and Elf approved and my wonderfully talented chef-friend will buy it for her cafe if I can make more. But, what’s super exciting is all the possibilities emerging from this one recipe. Vegan sausages from the leftover chickpea pulp? Why not? Or perhaps a chickpea cheese? What else will the silken tofu set with? Who knows, but let’s find out. When it comes to chocolate, I will never steer you wrong. If you have been here before you know chocolate is my master and I am a slave to preserving its dark, inviting qualities. 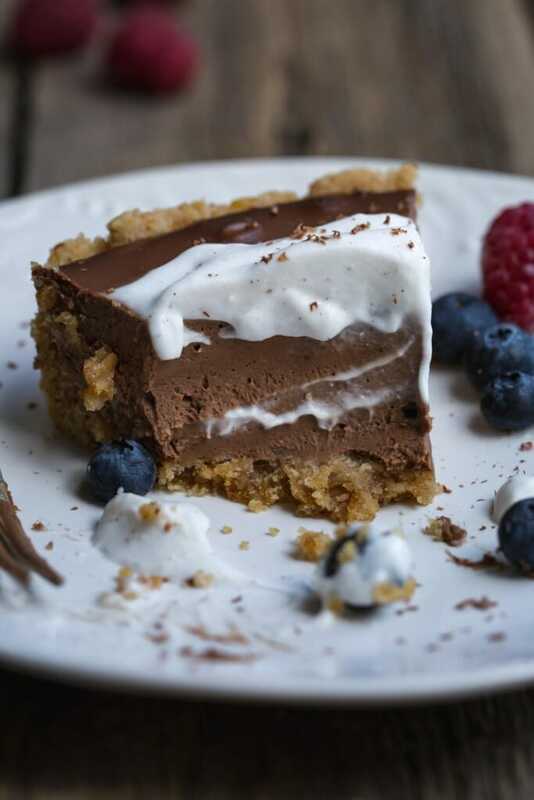 This soy-free vegan chocolate pie honours chocolate in all its goodness and while, yes it is made with chickpeas, who cares? This pie is phenomenal. This recipe began as a hunch. It grew in to an idea before working it's way in to a full blown culinary MOMENT. 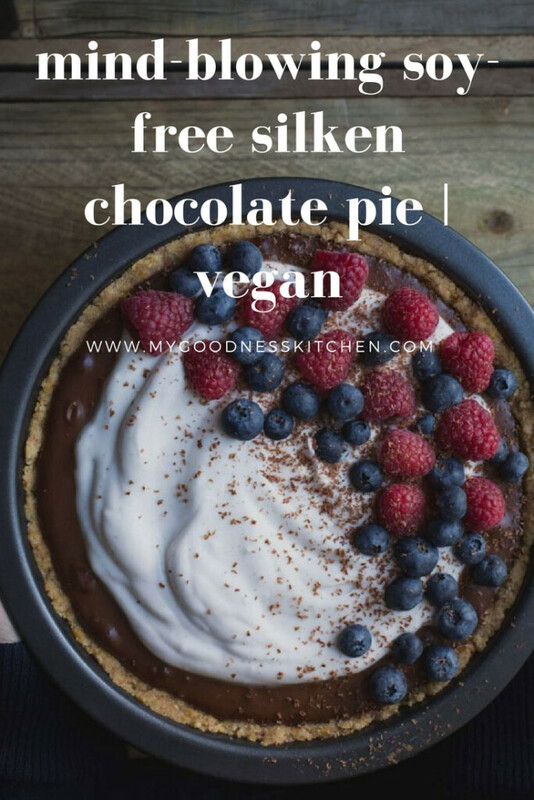 My Soy-Free Silken Chocolate Pie shouldn't work and it certainly shouldn't be a mind-blowing spoonful of silken creamy goodness. But it is. To make the chickpea tofu, drain and rinse the soaked chickpeas and place them in a high-powered blender. Add the water and blend for around two minutes or until smooth and thick. Place a medium saucepan on to your counter top and place a nut-milk bag or a muslin cloth inside. Pour the chickpea mixture into the bag and close the top. Using clean hands, twist and squeeze the bag until it release as much milk as you can. Set aside the bag and the remaining pulp. Place the saucepan over low to medium heat and cook, continuously stirring, for ten minutes. The milk will thicken to a super thick custard consistency. If you are not sure, ten minutes of cooking is a safe bet. Pour the mixture into a lunch-box style container with a lid. Leave on the counter without the lid to cool before placing it in the fridge to finish setting. Pop the lid on before it goes in to the fridge for at least two hours. To make a pretzel pie crust, preheat the oven to 170 degrees C. After blitzing the pretzels to a crumb, combine them, the sugar and the melted butter in a large bowl. Combine and press in to a medium pie (20cm or 7.9 inch) pan. Bake in the oven for 8 minutes. Remove from the oven to cool. To make the soy-free silken chocolate filling, blend the tofu, almond milk, almond butter, vanilla and maple syrup until smooth and well combined. Melt the chocolate either in the microwave or in a double broiler over the stove and pour in to the blender. Blend until all ingredients are smooth and silky. Pour the pie filling in to the pie crust and place in the fridge to set. The filling will be set in around three hours but a full day is better. 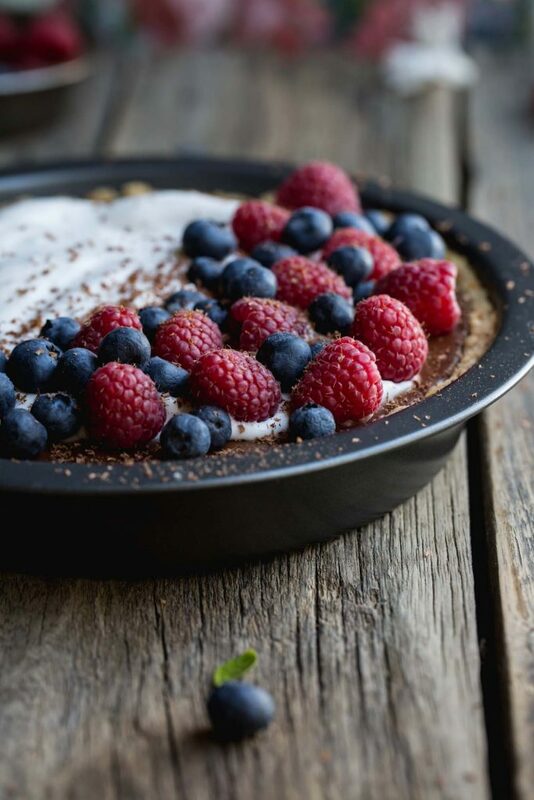 Serve with either a sprinkling of sea salt (trust me, it is divine) or a good dollop of whipped coconut cream and fresh berries. You will need a decent blender, a small lunch box size container and a nut milk bag for this recipe. Wow, this seems like such an amazing recipe! Do you think it’s possible to make a vanilla version of this one too? Hi Chantal. Thanks so much for the lovely message. I probably wouldn’t try a vanilla version with this pie – you will definitely taste the chickpeas. You could try a coconut cream silken pie recipe with lots of vanilla, maple and cocoa butter to set. I haven’t done it myself but it might be a good option. If you don’t want cashews, macadamias work beautifully in cheesecakes also. Or, is it a nut thing? These are yummy and delicious !! I like how you come up with these creations and they’re actually tasty, not just to look the part. Thanks Aria! This is one of my favourite recipes. I am so glad you like it. I thought for sure this would be coconut based when I saw the title, what a surprise! It looks delicious, and I love that it’s still high in protein without the soy. Thanks so much Alexandra. This tofu has been a revelation to me and I have to say, the pie turned out wonderfully. Thanks for your lovely feedback. Yep, mind blown! What a totally excellent dessert. So many possibilities!